The physical, mental and financial burdens of a paralysis diagnosis can be staggering. It is even more devastating when your injuries result from the negligence of someone else. 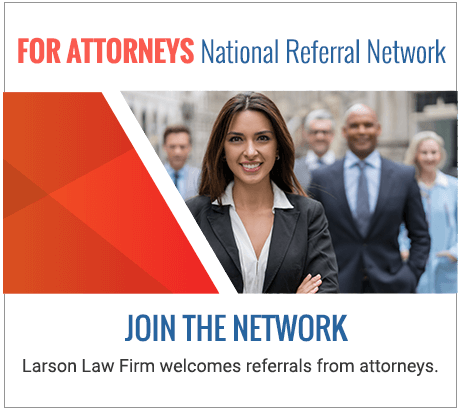 The experienced North Dakota paralysis injury lawyers of the Larson Law Firm P.C. have spent more than 35 years providing trusted legal guidance to severely injured victims. We earnestly advocate on your behalf to obtain maximum compensation for your catastrophic paralysis injury. Paralysis is the loss of muscle function and sensation in the body. It is often caused by damage to the spinal cord, which is a thick bundle of nerves that runs from the brain, down the base of your neck and spine, and through the vertebrae. If the head, neck or spine is injured, the brain cannot send messages to the muscles, which results in paralysis. We understand that medical care expenses related to this type of catastrophic injury can cause extreme financial strain on you and loved ones. We know that we cannot erase the physical pain of your injury, but we diligently handle every detail of your case, so you can concentrate on your recovery and rehabilitation process. This condition affects a single area of the body such as one arm or leg. A type of paralysis that affects one arm and leg on the same side of the body. Paraplegia is characterized by paralysis of both legs. Tetraplegia or quadriplegia. This most severe type of paralysis affects both arms and both legs. While this type of paralysis is less severe, it is still potentially debilitating. It causes extreme muscle weakness and loss of muscle tone. This painful condition causes muscles to become hard and tight, with uncontrollable spasms. The location of the injury on the spinal cord has a direct impact on the severity of the paralysis. For example, a severe neck injury such as a broken neck often results in tetraplegia and an injury located in the middle or lower spine usually causes paraplegia. If you or a loved one is paralyzed, and you are faced with a diminished quality of life because of your injuries, reach out to our skilled spinal injury attorneys today. As your trusted legal partner, we demand successful results and won’t stop until you receive full compensation for costly medical expenses, loss of income, and your pain and suffering. At the Larson Law Firm P.A., our legal team understands the long-term challenges of a paralyzing injury. We know that the cost of treatment and rehabilitation is too much to bare for most families, so we aggressively pursue compensation that adequately covers these costs, as well your pain and suffering. We assist you with your paralysis injury case at our office location in Minot, but we serve clients from Ward, Williams, McKenzie, Pierce and Mountrail Counties. Call us today at 701-484-HURT or complete our contact form to schedule a free consultation.